In the last Super Bowl, Baltimore Ravens rookie placekicker Justin Tucker became the first rookie kicker in 15 years to score a point in the Super Bowl. The last rookie kicker to score in the Super Bowl was Green Bay’s Ryan Longwell in 1998; he had a field goal and three extra points for six points in the Packers’ 31-24 loss to the Denver Broncos. 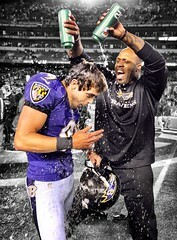 Tucker had a pair of field goals to go along with four extra points as he scored 10 points for the Ravens in their Super Bowl win. The 10 points in the Super Bowl by a rookie was the most since 1993 when Dallas Cowboys’ rookie placekicker Lin Elliott tallied 10 points on seven extra points and a field goal. With three high-profile first-year quarterbacks, Tucker didn’t get much attention for 2012 NFL Rookie of the Year, but the first-year kicker was honor-worthy as he made 30 of 33 field goal attempts (a success percentage of 90.9). He became the third rookie kicker in history to make 90 percent or better of his field goal attempts (minimum of 16 attempts to qualify). (Note: Another rookie kicker this year, Minnesota’s Blair Walsh, made 35 of 38 field goal attempts, 92.1 percentage. That’s the highest field goal percentage for a rookie kicker in the history of the league). Here’s a look at the nine rookie placekickers who have scored points in the Super Bowl. * The Bears’ Kevin Butler, with his 14 points, holds the Super Bowl record for most points by a rookie. Washington’s rookie running back Timmy Smith in 1988 scored a pair of touchdowns in the Redskins’ 42-10 Super Bowl win over Denver. His 12 points ranks second to Butler. * Of the nine rookie kickers who have scored points in the Super Bowl, six of the kickers saw their team win the title, three did not.